The charm for vintage inspired devices has seen a sharp rise in the last few years. Goodman, the true vintage representative of the British audio industry, is not far behind with the Oxford range. Now I love this for many reasons. First of all, the way it looks and feels. Secondly, it is called Oxford, my home town, and one of the best cities to be in! So, lets look at this beautiful radio in closer detail. The colour I had was porcelain, and while I am sure it is made of plastic, it does have a nice ceramic feel to it. The grill on the front hides the speakers behind it. The back stores the antenna and the power port, while the bottom has a battery compartment in it. The right side is plain, while the left has ports for both aux-in and headphone out. The top has a couple of classic rotary dials which allow you to turn your radio between off-on-volume (like the good old days), or choose radio stations. An LCD display takes centre stage, with a great scrolling display giving you the information. On the ride side are 6 chunky old style push buttons, that let you choose radio stations, select between DAB and FM and scan, as well as three preset channels. A leather band lets you carry this around. It takes 6 C batteries to run, in case you’d like to power it by battery. That is good, because they are standard batteries, and you don’t have to fork out on some specialist battery. It is bad, because they may be standard, they are not AA or AAA, which is mostly used these days. Usage is simple. You turn it on, you scan, and off you go. As simple as it gets really. It offers both FM and DAB, just in case your favourite radio station hasn’t made it to DAB yet, though I stick with DAB most of the time I am playing with this. The small portable size makes this ideal for most offices, kitchen usage, or just listening to in your bedroom while you read. The sound will not blow you away, and it won’t beat a hi-fi system, but by no means is the sound lacking in any way or form. I have tried my usual bunch of radio stations on this, from BBC 6 Music to Planet Rock, from Classic to Radio 4. They all provide a fulfilling experience, and fill you with joy. 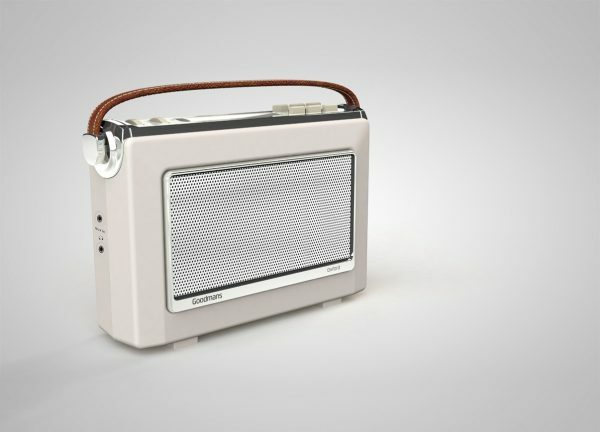 I guess in this case, the visual charm of this beautiful radio just adds to the charm. It retails for £59.99, and comes in porcelain white and moss green, with sky blue and slate coming soon.